This novel jumps right in to a dilemma between the two main characters: they just found out they will be working together. To them, this is NOT a good thing. Why? The author explains in the following chapters. In chapter two we are immediately brought back two years to when the main characters met. Haley and Gavin are in college, and the only relationship they have is a competitive one as they are both vying for top of the class. On Christmas break back home, both meet up for the first time outside of class, but not in the best of circumstances: Haley lost control on the ski slopes and the only one there to rescue her is Gavin. Convenient, right? The two characters share clean, witty banter and by day’s end they decide to try dating. We see them fall in love and Gavin about to propose when Haley cuts him off with no explanation. However, the reader comes to find out that it was because Haley was diagnosed with ovarian cancer. She knew if Gavin found out, he’d put his life on halt for her. Something she couldn’t allow to happen. Back to where the book started, after many misunderstandings and short encounters, we now see the two working together. Gavin can’t stop thinking of her, but is still hurt by Haley shutting him out of her life. Haley still has feelings for Gavin, but the only thing she can think of at the moment is the fact her cancer may be back. Eventually the story must come to an end. All the wrongs have been acknowledged and cleared up. The two love birds decide to try their relationship again. Where do the dogs fit in, you ask? Well, on more than one occasion a dog brings Haley and Gavin together in a very cool way. Sounds like a good book, right? Because I know you’ll say “yes”, here is the info you need to pick it up for yourself! This book is so good that it has a rating of 4.7 out of 5 stars! 34 reviews, too (as of February 1, 2017)! Apparently this is the sequel to Noelle’s Golden Christmas, but you don’t need to read that in order to understand this one. 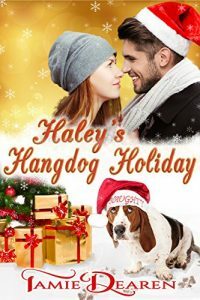 Haley’s Hangdog Holiday is a complete standalone. The novel is 200 pages of pure delight! Tamie Dearen used her amazing writing skills to bring descriptive scenes and well-developed characters to Haley’s Hangdog Holiday. I could visualize myself in this novel, and found myself hooked from page one until the end. The love story was sweet and I loved the many faith lessons thrown in. At the end we’re left hanging about whether or not Haley’s cancer has returned, BUT that isn’t the focus of the story anyway. It ends romantically. In fact, I have to say something about Gavin in regards to his love for Haley. He is so persistent and extremely committed – something more of us should be like. And when he finally realized Haley had cancer and might have it back, it didn’t scare him. True man right there! He wants to be with Haley every moment for who she is today, not worry about what might happen in her future. So, so sweet, you guys!!! One last thing I want to mention. The faith lessons that were thrown in touched me as I could totally relate to some of the things the characters faced. One of them being anxiety. I thought the picture of keeping our eyes on Jesus in the storm when the waves and wind are all around us was spot on! Enough said. You’ve got to know I gave this 5 stars!!!!!! Now, without further ado, here is the link so you can get your own copy. You won’t regret it!